The blurred aspect is due to large quantities of airborne sand. Another moment from one of our hikes on the southwest beaches of the Point Reyes National Seashore. We walked out to the estero between Drake’s Beach and Limantour, and the only other people we saw were volunteers who were there counting any dead animals on the beach. The day before, they told us, they’d been counting live birds, but today it was the dead. Fortunately, several miles of beach walking had only turned up one dead shorebird, a seagull. Had we seen anything dead? Yes, we had, but just the usual massacre of crabs at the beaks of seagulls and other shorebirds. Nothing out of the ordinary. Keeping count is an important aspect of understanding our impact on the world around us, one that is frequently forgotten. We are used to taking a census of the human population from time to time, but there are surprising gaps in our knowledge of the natural world simply because we sometimes have very few baseline numbers from which we can assess change. One good example is the lack of knowledge regarding the population of the American eel, even as the young are being harvested in record numbers. Harvest numbers, at least, are a means of counting the numbers removed from a given population. As long as a population has the subjective appearance of abundance, we often assume the animal (or plant) populations are healthy. Often enough, the baseline numbers are a point of contention – see varying assessments of animal populations when it comes to hunting season, for example the disparity between government and environmental organization assessments of Canadian harp seal or polar bear numbers. The seal population on the Drake Estero seemed smaller to me than it had two decades ago, on my last hike out there during pup season. But that is my own purely subjective observation. 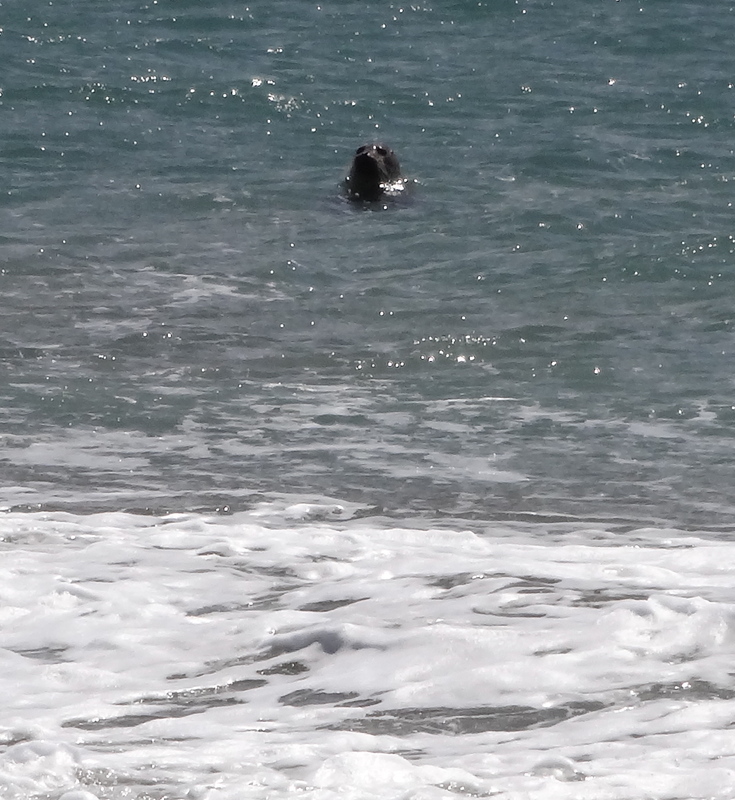 I do wonder, though, what this seal was thinking about the numbers of bipeds on the beach – he peeled off from the group lounging on the beach and followed us for about an hour, watching from the surf.